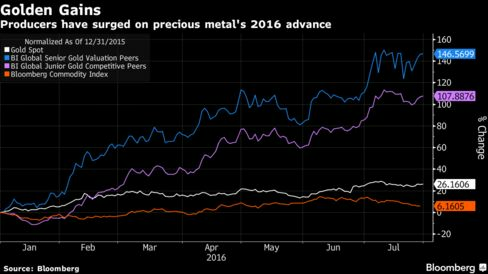 A $50 billion gold-industry deals spree is extending into its third year, even as a surging bullion price makes sealing transactions and valuing mines more difficult. Gold has regained its luster as investors seek havens from volatile markets and weak interest rates. While the metal is up about a quarter this year, the value of mergers and acquisitions has soared. The average paid in 133 transactions in the three months to June was $64 an ounce of gold equivalent in the ground, up from $36 in the first quarter of 2016, as buyers factor in better long-term price expectations, according to Bloomberg Intelligence. Barrick, the biggest producer, last week announced plans to sell its 50 percent share in Australia’s largest open-pit gold mine and joint owner Newmont Mining Corp. has signaled it would be willing to buy the stake at the right price. The stake may fetch as much as $1 billion, according to people familiar with the matter, while analyst valuations range from $400 million to about $1.5 billion. Mergers and acquisitions and the metal’s surge this year after three straight annual declines will be major topics discussed by about 1,800 delegates, including executives from Newmont and AngloGold Ashanti Ltd., at the annual three-day Diggers and Dealers mining sector forum in the Western Australian town of Kalgoorlie. Completed and pending gold sector deals totaled almost $9 billion in the first half, including Newmont’s $1.3 billion sale of Indonesian copper and gold assets to a local consortium and Centerra Gold Inc.’s $1.1 billion purchase of Thompson Creek Metals Co. Volumes rose in 2015 to $21 billion, the highest annual total since 2011. Bullion for immediate delivery was little changed at $1,350.63 an ounce at 2:08 p.m. in Sydney, according to Bloomberg generic pricing. It’s rallied 27 percent this year, rising 2.2 percent in July after back-to-back quarterly gains. Gold Road Resources Ltd. is in talks with four parties over the potential sale of a stake in its Gruyere development project in Western Australia and will demand any deal reflects the higher bullion price, according to Chief Executive Officer Ian Murray. Valuations vary on Barrick and Newmont’s Super Pit in Kalgoorlie — a giant 3.5-kilometer (2 mile) long operation at a site where metal has been produced continuously since a late 19th century gold rush — not only because of price assumptions but also on views that exploration could extend the mine’s life beyond a slated close of 2030. Barrick President Kelvin Dushnisky said the company would sell assets including the Super Pit — if it got a fair price, according to an interview last month. Likewise, Newmont’s Gary Goldberg said in July that it would like to acquire Barrick’s stake, if they could come to an agreement. After mid-sized producers, including Northern Star Resources Ltd., completed a raft of mine acquisitions from larger rivals, activity is now likely to accelerate in company takeovers and asset deals among smaller companies, according to PCF Capital’s Twigger. Perth-based Northern Star said Monday it had agreed to sell its Plutonic asset in Australia to Billabong Gold Pty, to focus on its assets at Jundee, Paulsens and in Kalgoorlie.